Lawler’s patented Series 800 high-low master controller technology offers a unique solution when designing for high-capacity systems. 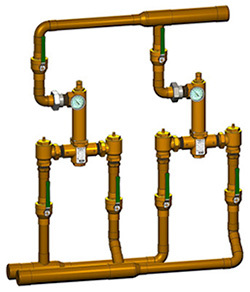 This pre-piped, factory tested parallel system can meet your need for increased capacity or for a redundant system in applications where the domestic hot water system cannot be interrupted. Lawler’s Pre-Piped Double Parallel System is a part of Lawler’s Power of OneTM pre-piped, pre-packaged, pre-tested systems, intended to give you one point of design and one point of accountability. Parallel units can be assembled using Lawler’s 801, 802, 803, 804 or 805 thermostatic high-low master controllers. Lawler’s patented Series 800 high-low master controller technology offers a unique solution when designing for high-capacity systems. 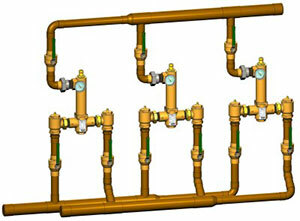 This pre-piped, factory tested triple parallel system can meet your need for significantly increased capacity or for a redundant system in applications where the domestic hot water system cannot be interrupted. This complete solution is a part of Lawler’s Power of OneTM pre-piped, pre-packaged, pre-tested systems, intended to give you one point of design and one point of accountability. Note:Lawler can also assemble Pre-Piped Quad Parallel Systems when your demand is unusually high. All Lawler parallel systems can be assembled using Lawler’s 801, 802, 803, 804 or 805 thermostatic high-low master controllers.